Children and parents alike will treasure this timeless story that reveals the biblical truth-the best gifts come from the heart. Each copy of The Three Gifts of Christmas also includes a CD audiobook. The audio version features narration and character voiceovers by Jennifer Wilson, an accomplished vocalist and Christian educator. Her dramatic reading is underscored by original musical accompaniment by composer Jay Rouse, one of the leading arrangers and orchestrators in Christian music publishing. Christmas has come again to the kingdom, but the king and queen (the original princess in The Princess & the Kiss) have a serious problem. Their precious daughter is becoming spoiled. No longer does she appreciate her gifts as she should nor does she remember the true meaning of Christmas. Her troubled parents come up with a plan to cure the princess of her selfishness. 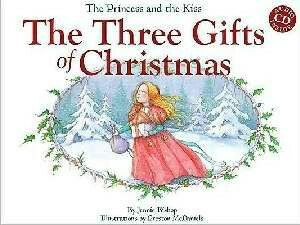 This Christmas will be different-she will receive only three gifts, each one as precious as the princess is to her parents. What will the princess do with the gifts she receives? Will she at last discover the true meaning of Christmas?